This dish is from Fung Mei’s Sichuan menu, and if you’re “fried out” of dishes like dry fried eggplant, this mix of vegetables, noodles, and creamy soft meat is a worthwhile addition to your Sichuan choices. Vegetables, noodles, plenty of spice, and creamy, fatty, delicious meat. Try it. You won’t be disappointed! 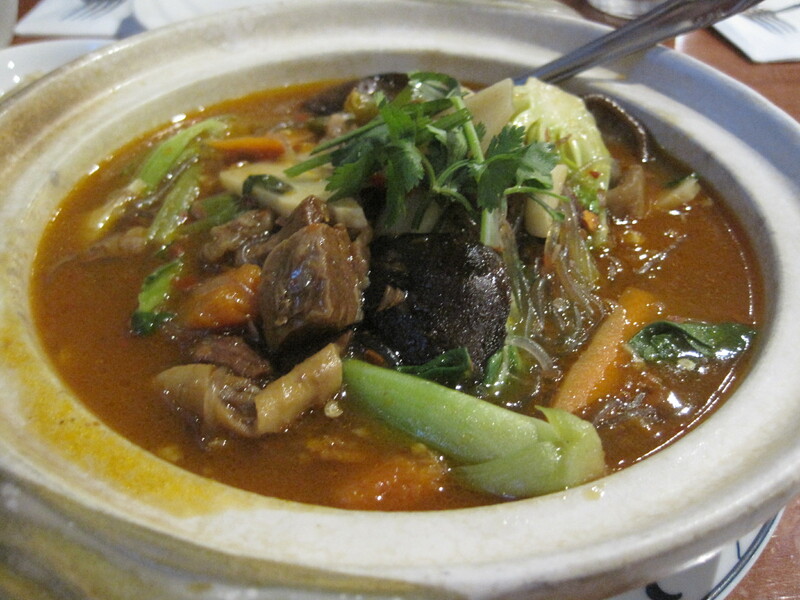 I’ll note that Fung Mei’s E1, Chicken with Dried Red Pepper, is becoming better and better. In other venues, this dish is called “Shan City” chicken. IMO, this version is currently the best in town. 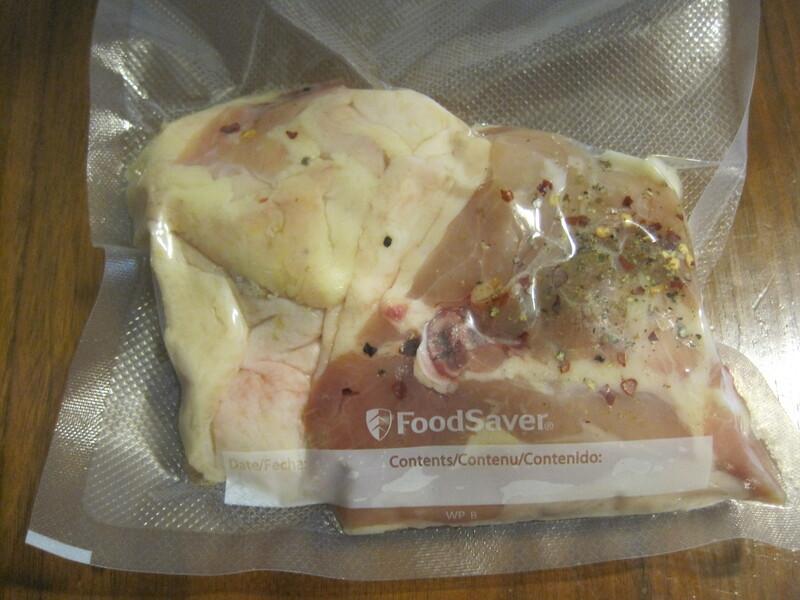 Some notes on sous-vide chicken and temperature calibration. I have an accuracy issue with my Auber temperature sensor, and it goes something like this. I have a separate thermometer, and when the Auber is first on, the rwo agree within a degree. As the Auber probe remains in the pot however, the difference in measurements increase, until after some time, I see this. Pot equilibrated to a measurement of 144, a few minutes after adding chicken. Note the temp difference between the two probes. Who to believe? So who to believe? I’m concerned the Auber is underestimating temperature, because of the beef color of cuts like this, which was supposed to be cooked at 130 to 132 degrees F.
Nam Dae Mun ribeye, sous-vide and plated. Cooked perhaps 4 hours at Auber nomimal 130. The above, sliced. Does that look medium rare to you? So yes, I’m looking into how to accurately gauge and calibrate temperature with this setup. I’ve also been playing with higher temperatures, in part so I can cook chicken, which is a substantially smaller portion of meat than some of these big steaks I’ve been eating. Jimmy (@EatItAtlanta) tweeted before my experiments that he wasn’t happy with the meat near the bone of chicken cooked at 140 F. Since I’m using a PID controller, and it overshoots temp by 2 degrees during the first couple hours, then the kinds of temperatures I’m looking at for my setpoint are 2 degrees below the cooking point. But if it’s actually running 3 degrees cool, I need to compensate by 5 degrees. Does that make sense? PID controllers overshoot and then narrow in on their target temperatures. That first overshoot peak defines the actual cooking temperature for my controller. 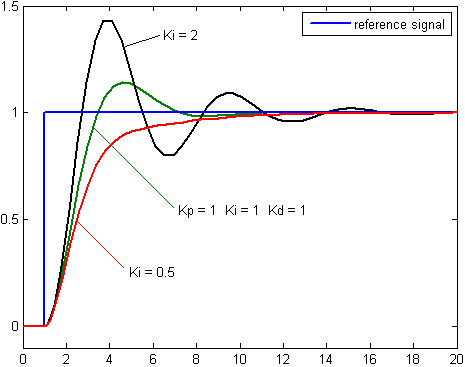 In practice, I overshoot by about 2 degrees F. Image above from Wikimedia, and the PID controller article on Wikipedia. 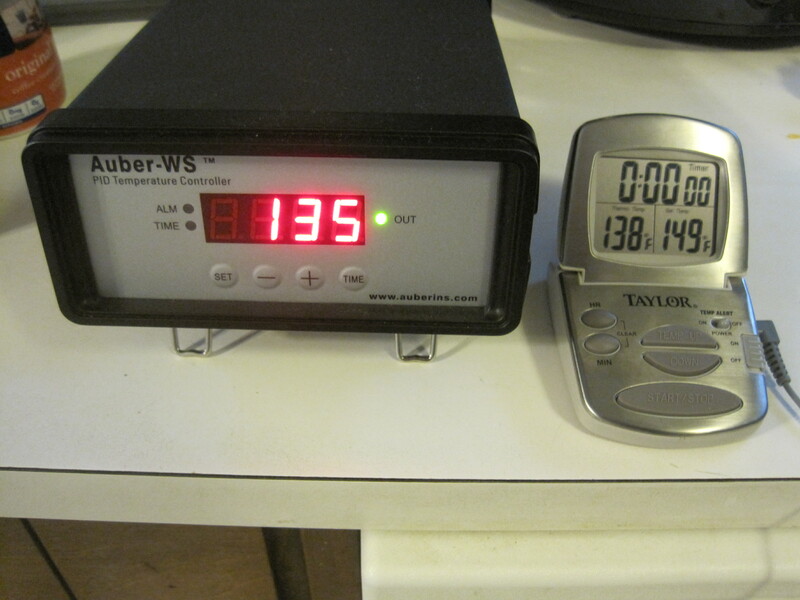 The French Culinary Institute’s PDF on sous-vide recommends 1-2 hours for chicken at 65-66C (149-151 F), and that means the two Auber temperature settings I needed to test are 144 F and 147 F. So we tested those. 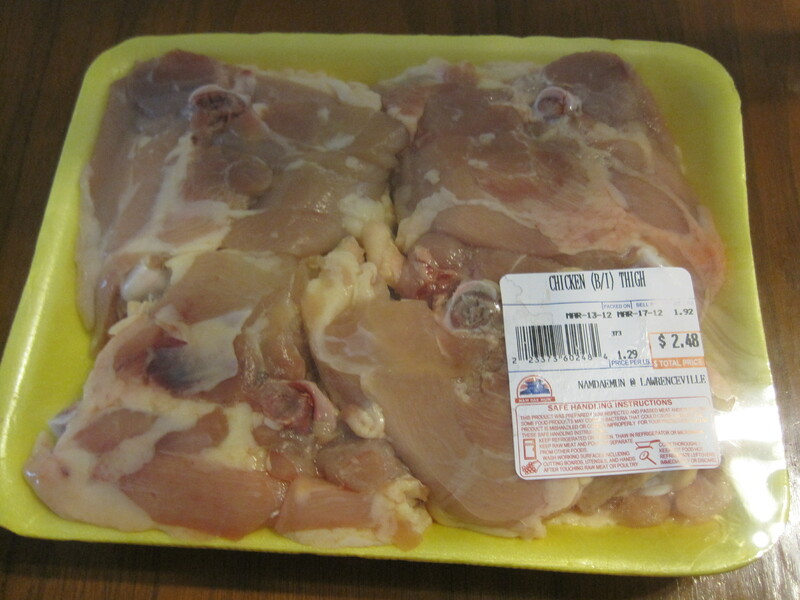 Nam Dae Mun chicken thighs. Note the price. Spiced and sealed. I used cracked black pepper, red pepper, crushed red pepper (pizza pepper), some onion and garlic powder, and a dusting of poultry seasoning. Cooked 90 minutes at 144 from room temp and plated. 2.5 hrs at 147 from frozen has a similar appearance. I prefer the flavor and texture of the hotter product. Results? I liked my chicken better at 147 than 144. The looks are about the same at both, and at both, you really do need to trim off the chicken fat, because unlike frying, the fat that results from this technique isn’t much fun to eat. 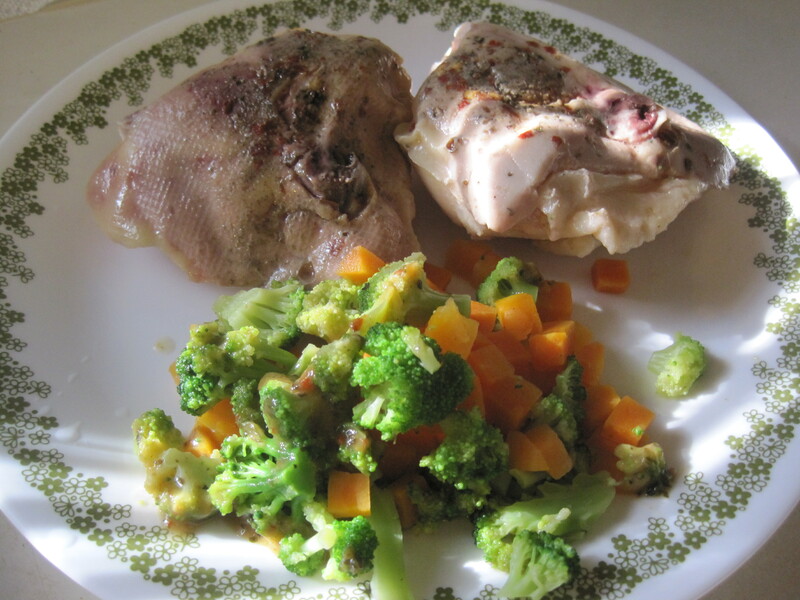 The chicken is amazingly juicy, and you might find it not cooked enough for your tastes. If so, just keep ramping up the temperatures until you’re happy with what comes out of the controller. As for me, I need a better way to calibrate my device. I would like to nail a good medium rare on the steak side. For now, I have a useful working temperature on the chicken side. Havana South Restaurant and Bar is just off I-985 and exit 4, to the west maybe one block, just south of Buford Drive. I’d call it a little place but it isn’t small, really. My recollection is a bar, and maybe 10-15 tables and booths. However, this not-so-large restaurant does a lot of things right, including its outsized effect on your taste buds. We dropped by for lunch. After a few minutes with the menu, I chose the black bean soup and a Cuban sandwich, and my daughter chose their masitas puerco. Maduros (sweet plantains, fried) came with the Cuban. My daughter’s dish contained large chunks of marinated pork, a side of black beans, and yellow rice. The serving size I’d judge as large. The pork was really good, crispy and chewy on the outside, soft, hinting of the marinade inside. Everything on her plate was the opposite of plain. The beans had flavors that just baking won’t give, hints of onions and other influences I couldn’t entirely tease out, but mixing well with the dark flesh of the beans. I thought her beans were even better than my bean soup. The yellow rice came across the same way, a full body of flavors, more than just something simmered in a pot. The Cuban I liked as well. Cuban sandwich and maduros, fried sweet plantains. The sandwich was made with good quality bread, and had a nice balance between the pork and ham. The pickles and cheese only added to the flavor mix and the serving size was large. The maduros were good and sweet, though I know my wife, who likes most things well done, would prefer her maduros a little crunchier. That said, I’m pretty sure I could take her here. In short, the meal was great. The only thing I’d do differently if I came back again is get the side of black beans. In my opinion, they’re better than the soup. Service was very good throughout the meal. Verdict: Quality food with flavors that surprise on almost every bite. Staples done exceptionally well. Very highly recommended. Chow Down Atlanta has an excellent review of Havana South. You might think she’s praising Havana South too much, but in my judgment, she’s actually on the mark. Desta Ethiopian Kitchen is in a collection of shops on the corner of Briarcliff and Clairmont Road. It’s a block south of the I-85 – Clairmont Intersection, and on the right as you’re heading south. It’s not easy to see, more on the Briarcliff side of things. When you see what looks like parking, pull off the road and look for it. There are at least three other Ethiopian restaurants in the area as well. Desta is in a separate building, and you may see the drive through before you see the rest of the restaurant. There is outdoor and indoor seating, and a decent amount of parking by the restaurant. Inside, it’s quite an attractive restaurant, if small, and there are both tables and booths to sit in. I came here on a Father’s Day, after having argued the merits of 2-3 other places. I had eaten Ethiopian food about 22 years ago, in a restaurant in Philadelphia. On that day, the food was laid on a huge chunk of the Ethiopian bread (called injera, and made with the grain teff) and the food placed over the bread. Injera is spongy, and it is intended to be used as a utensil. We tore up bits of our plate of bread, scooped up the food, and ate it. From what I could see in the newspaper, the arrangement in Desta was going to be a little different. We ordered chicken, fish, and lamb tibs, and my wife was also curious about their lentil stew. So we ordered a side of that. When the food came, the dishes were served on long rectangular trays, maybe 3 inches wide and perhaps 12-14 inches long. All the meats and fish were cut into small chunks, to be easy to handle. Each dish came with a house salad on the side. And in shallow grey pans came the pale brown injera, rolls of it, as long as the palm of your hand and the roll perhaps an inch to an inch and a half thick. My wife ended up asking for a fork. My daughter and I took to the bread easily, and tore off chunks of it to eat the food. The stew came with a spoon, and I’d pour some of the stew into a chunk of the bread and eat that as well. My daughter loved her fish, which was mild and a little crunchy. My wife liked the chicken quite a bit (it had a yellow color to it and seems to have been nicely spiced) and I liked the lamb dish I chose. We had differences of opinion about the lentil stew. My daughter and I liked it, my wife wasn’t as happy with it. One thing that is easy to do at Desta is underestimate how much food you’re really eating. The injera ends up being a lot of your meal, and so what seems like a small serving can end up quite a large one. As a consequence, we took home food from every plate that was served to us, along with about six rolls of the bread. Given the quantity of leftovers, the meal was shockingly inexpensive. Service was generally excellent. Verdict: Delicious ethnic food served in a way that doesn’t shock as many first time Americans. Highly recommended for those looking for something new. Update: Amy on Food’s nice review of Desta features some excellent photos and a review of the foods she tried. Longhorn Steakhouse is a well established chain in the US, roughly equivalent to Outback or Texas Roadhouse, that serves steaks, chicken, and seafood in a clean modern setting. I’ve been to various Longhorn Steakhouses many times, and all in all I prefer Outback slightly, because I think Outback’s entrees are a little cheaper and their service is a little better. I have friends I hold in high regard, however, who hold exactly the opposite opinion. I suspect the difference between the mid priced steak houses is mostly a matter of personal taste. There are two Longhorns in Snellville, and this review covers the one at the corner of Web Ginn Road and Highway 124, in the open mall known as Avenue Web Ginn. This is a Snellville location, though just by crossing Web Ginn Road, you are then in Lawrenceville. When this restaurant first opened it was packed and impossible to get into. The wait was well over an hour and the receptionists were unable to accurately estimate time. I left lines for this place at least twice because a “half hour” wait stretched into an hour or more. The lines have calmed down in the meantime, and my daughter and I came recently during lunch. We were seated quickly and a waiter was with us shortly. Drinks were rapidly served and we both ordered salads, my daughter a salmon salad and I had the 7 pepper sirloin salad, medium rare. In the meantime, we were served Longhorn’s bread. It’s a round loaf, as opposed to the elongated loaf of other stores, and it was already sliced, a handy convenience. Longhorn’s bread is quite good. Both salads were good. My daughter’s salmon was cooked, as opposed to undercooked, and while my salad ended up with medium well steak as opposed to medium rare, the steak was quite good and full of flavor. At points I thought the 7 pepper crust was a little potent, but in a salad with steak, blue cheese, balsamic dressing, and a pepper crust, there will be some strong flavors. I found the service to be good, but not great. They seemed surprised when our glasses were empty. Some of that could simply be the time we came. Lunch isn’t as hectic as dinner. Verdict: Recommended. Very good steaks, good seafood, good service. It’s in the northeast corner of the strip mall on the northeast corner of Singleton and Jimmy Carter, just a block or two east of the intersection of Jimmy Carter and I-85. It’s unpretentious from the outside, and inside, there is a wide counter where you order and pick up food. Just above the counter is a wide photographic display of the foods Mughal’s Restaurant serves, and throughout the restaurant, there are a collection of long tables and chairs. Mughal’s is in part a Pakistani restaurant, and I didn’t have a good idea of what they serve. But the staff was polite and helpful, and we chose the Butter Chicken, the Chicken 65, Bhuna Gosht, a couple orders of naan and a couple orders of beef samosas. It didn’t take long for them to prepare the food. The price of my meal, in comparison to other South Asian restaurants, was relatively cheap (most entrees run about 5.99 to 7.99 each). I took it to go, and brought it home to my family. Well, the Chicken 65 was a big hit, the chicken a dark red color, spicy, deep fried, and delicious. The naan was really good, warm, delicious, and had a bit of a crust. The samosas were small compared to others I’ve had, but they were tasty bites of beef wrapped in a triangular pastry. The Bhuna Gosht was a nice curry flavored beef dish, and while I wasn’t all that impressed with the Buttery Chicken, my daughter enjoyed it a lot. Verdict: Recommended. Good tasting food, inexpensive and unpretentious. I’m sure I’ll be back to this place. “Bittman” burgers – are they ‘out there’? The patties should weigh about 6 ounces each: not small, but not huge, either. Handle the meat gently. Make the patties with a light hand, and don’t press on them with a spatula, like a hurried short-order cook. Then work gently to make thin patties. If you really pack the burgers (particularly if you’re using leaner beef), they will acquire a dense, meatloaf-like texture. Thin burgers cook quickly and don’t ball up into fat pucks (heat tends to shrink the patties), plus you get a good balance of meat, toppings and bun in each bite. Gently press and stretch the patties, sprinkle them with a little salt, and make your way to the grill. To get a nice char on the meat while keeping the inside juicy, cook over high heat, according to Flay, who cautions that you shouldn’t play with the meat while it’s on the grill: Place each patty on the grill (which you should have preheated for 15 to 20 minutes), let it get brown and slightly charred (this will take about 3 minutes), and then flip it. Flip each burger only once or they will start to fall apart. Don’t press on the burger either; this will cause juices to come out of the meat and will cause annoying flare-ups. I have had in my life, maybe one and a half, maybe two “Bittman” burgers, burgers that were not flattened until the meat was firm and hard. Both times I’ve have had them at Ted’s Montana Grill, once in Cumberland Mall, and the half in Snellville. In each case the meat was almost falling out of the burger, the patty really wasn’t held together with much more than a prayer. But the meat is insanely tender when handled in this way. It’s not a style of burger that everyone likes. My reader Susan doesn’t, and calls them “crumbly”. Personally, I like the idea of hamburger that almost melts in the mouth and is, to my tastes, sublime. I’ve been in communications with Foodie Buddha on the matter, he of the affable disposition and the nice burger joint tag. But I really want to throw this whole question open to the blogosphere: is there any restaurant in Atlanta that actually serves a good “Bittman” burger? Is there any restaurant anywhere that serves a burger without being pressed to death by short-order cooks? If not, why not? If so, why? 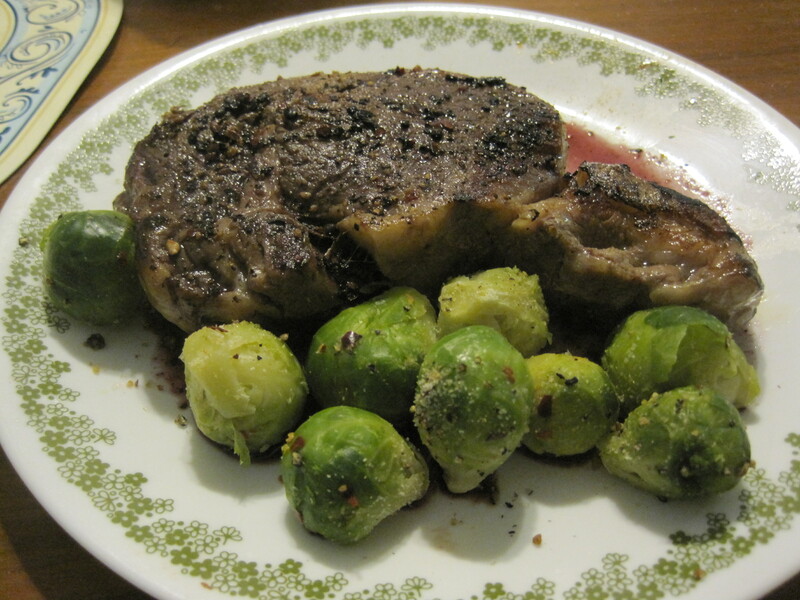 Notes: The blog ToastPoint has an interesting attempt to make a “Bittman” burger at home. Other interesting Bittman burger articles include the “Inside out Lamb Cheeseburger” and “The Real Burger“. 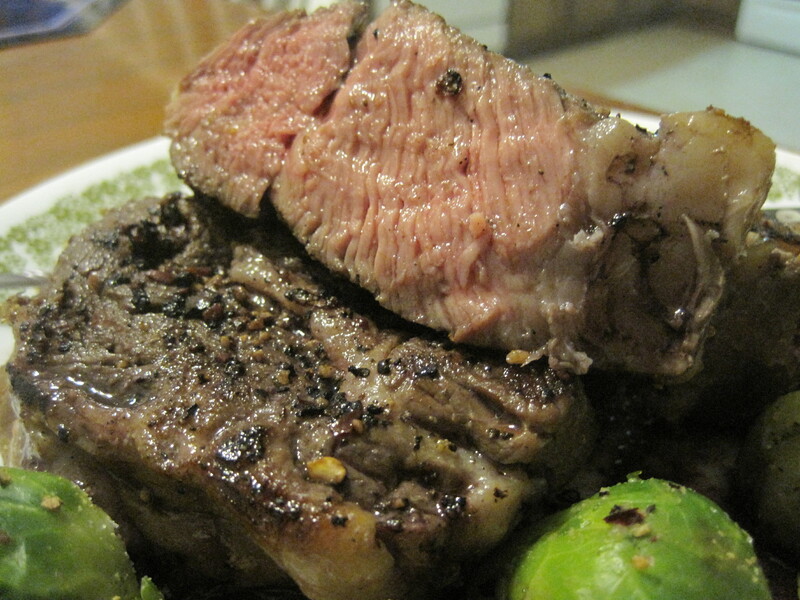 The blog “Eat” has an intriguing article on making a Bittman style lamburger. Checking the WordPress tag “great hamburgers” yields this interesting blog report on Burger Meister in San Francisco from the Meat Meister’s blog. Checking the WordPress tag “the perfect burger” reveals this review, by Dorothy on the Hill, of a place called the Eat Bar, in the Washington D.C. area.